In 1979, Jim purchased the building at 1b Downshire Hill in Hampstead, London to house the creature building workshop for The Dark Crystal. A former post office, it was a large open space with a high ceiling and mezzanines along the sides, ideal for creating over-sized puppets and experimenting with messy materials. The long development process for the film introduced a new team of artists and engineers to Jim and allowed them to invent all sorts of new ways of making puppets. 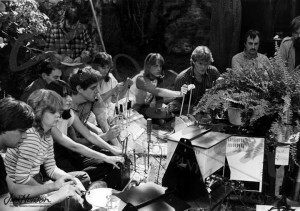 By the time the film was finished in 1982, Jim recognized that the combination of his experienced and collaborative team with a central place for their work was a huge asset that should be maintained. He sought outside work to keep them busy until they were needed for his next fantasy project which turned out to be Labyrinth. 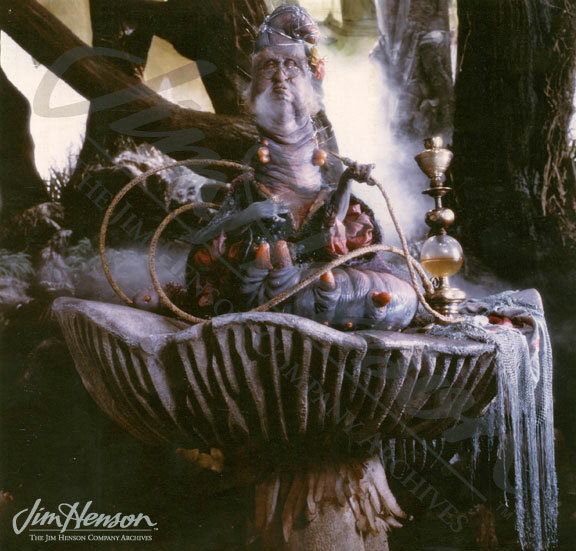 The first non-Henson project at the Creature Shop was creating characters for Dreamchild, a film written by Dennis Potter. Jim admired Potter’s work, particularly Pennies from Heaven, and was pleased to have a chance to work together. Jim wrote Potter after the premiere, “Your delightful script made the film a joy to work on. I feel proud to have my name on a picture of this calibre, and to be associated with your efforts.” The film was the story of the friendship between Alice Liddell (inspiration for Alice in Wonderland) and the Rev. Charles Dodgson (aka Lewis Carroll). Most of the film was live-action, but it featured a fantasy sequence with Henson-created characters based on the Alice books. 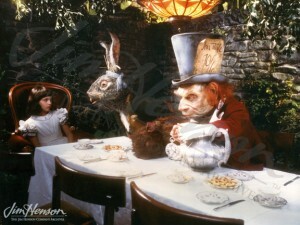 The tea party in Dreamchild, 1985. The Caterpillar from Dreamchild, 1985. Puppeteers on the set of Dreamchild, 1984. This entry was posted in 07-July '84, 1984, Dark Crystal, Labyrinth and tagged Coral Browne, Creature Shop, Dennis Potter, Dreamchild, Lewis Carroll, Lyle Conway, Return to Oz. Bookmark the permalink.